I often catch myself imagining what fishing on Cape Cod was like “way back when.” I like to picture Cape Cod without the bridges and marinas, when it was still a wild place. Can you imagine what the fishing must have been like 1,000 years ago? It may be difficult for us “modern day” anglers to understand how people caught fish back then. They didn’t have any sonar or GPS at their disposal. Forget about engines that brought you to the fishing grounds and back at 30 mph. Fishermen of 1,000 years ago relied on a much different set of skills than we do today. During my last fishing trip I had an epiphany. I realized that when I fish on my boat, I spend the majority of my time focused on a small pixelated screen. Is this fishing, or just a different form of watching television? I think I am undergoing a change of sorts, because I feel more drawn to fishing the old fashioned way and less drawn to modern day strategies that rely on technology. I’m not about to rip the transducer off my boat, but I might someday. For now I’m going to fish the beach, because success on the beach is more about being in tune with the environment, and less about blotches of orange on a sonar screen. I guess the question to ask is, how would you fish without technology? It was 48 degrees the other night, which means that the seasons are changing here on the Cape. Fish behavior, especially striped bass behavior, is changing too. If we want to connect from the beach, we will have to figure out where stripers are moving along the shoreline. Using sonar is not an option when fishing on foot, which means finding fish is going to be much more of a challenge. 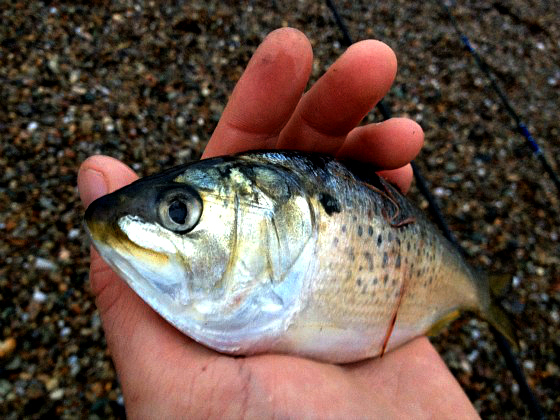 The good news is that during September and October, striped bass are much more apt to come in tight to the shoreline. The only question then is where are they going to show up? 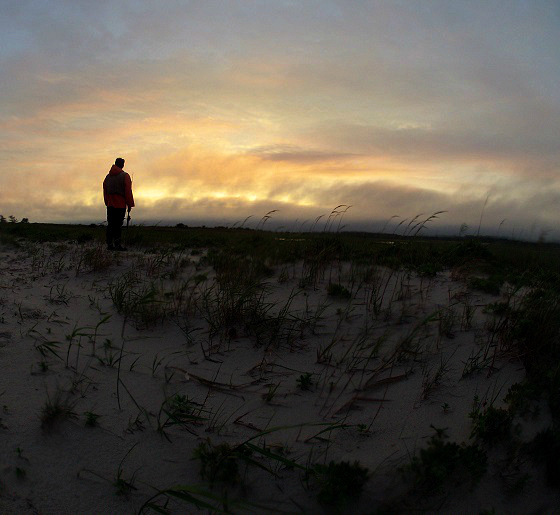 The vastness of the beach can be intimidating, especially on Cape Cod’s National Seashore. There’s a lot of sand out there, and odds are that most of the shoreline does not contain any life at all. 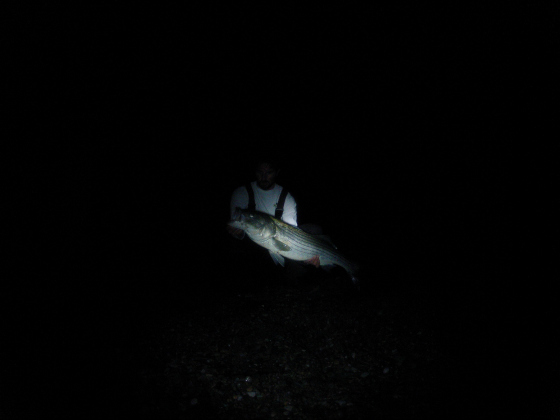 It’s very possible to go weeks on end without catching a single fish. Finding the bite in these situations requires a fisherman to tap into a skill set that most of us don’t use when finding fish with electronics. In these instances being in tune with one’s environment is a much more valuable tool than a pixelated screen. How would fish travel along this shoreline? Why would fish bother to show up here in the first place, and what on this beach may attract fish within casting range? When would fish be most likely to venture in close to shore here? Based on all of the above, how should I fish here and what fishing technique will give me my best chance at hooking up? In my mind, fishing the beach is like piecing together a jigsaw puzzle. The best strategy for me this season has been to “take it all in” and then connect the dots. For me there is no set formula to speak of. I try to just go with whatever feels right. I think the success of ancient fishermen relied heavily on the fisherman’s knowledge of his quarry. Fishermen back then were intimately entwined with their prey. Today we know a lot about fish biology, and we have many useful statistics and studies to look at. Yet fishermen of old caught plenty of fish without any books (or websites-LOL) to help them. How did they manage to do it? Without electronics I think their only option was to imagine that they themselves were their quarry. On land it’s called “putting yourself in someone else’s shoes.” Applying the same concept to fish can be very useful. 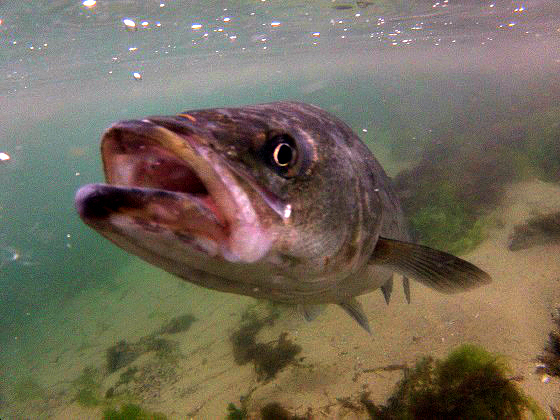 For predatory fish like striped bass, the search for food is probably the most dominant force in the animal’s life. So a good idea for us fisherman is to locate a food source. The fish must eat, so if you can locate their food source it’s only a matter of time until they show up. Envision that you are a fish, as foolish as that may sound, and finding fish suddenly becomes a heck of a lot simpler. I imagine that if I was a 40 pound striper, I would really love to find a massive school of pogies or mackerel. The next best option for me as a fish may be sand eels, crabs, lobsters and other bottom dwellers like scup or baby flounder. So as a fisherman, if I can’t locate a stretch of beach holding pogies and mackerel, I might as well find an area with some sand eels, crabs, lobsters and other food options. I may find that I walk for quite a while without casting until I find an area where lobster pots come in close to shore. Or maybe I think about the type of environment most attractive to baby flounder and then find and fish that area. Or it could be as simple as paying attention to when your kid digs up a bunch of sand eels in a tidal pool. Your 8 year old may of just found you a surf casting hot spot. Success from the sand relies heavily upon good timing and fishing the right tide. Since your fishing zone is limited to how far you can cast, you really need to put some thought into which tide and time of day will draw fish in close. Try thinking about it this way. Most people stay close to shore when they go for a swim. Us land based animals don’t mind swimming out deep, but we feel more comfortable in shallow, where we can stand and retreat back to land when we want to. I’d imagine big stripers feel the same way, just in the opposite direction. For a trophy fish to come in close to shore, within casting range, the fish is going to have to feel comfortable swimming in close to shore. I would imagine that most big fish feel most at ease with a fair amount of water above their heads. So when you look at a particular beach, think about which tide will make fish in that area feel most at ease, and draw them within casting range. Depending how the beach is structured, high tide might be best because near shore areas fill up. 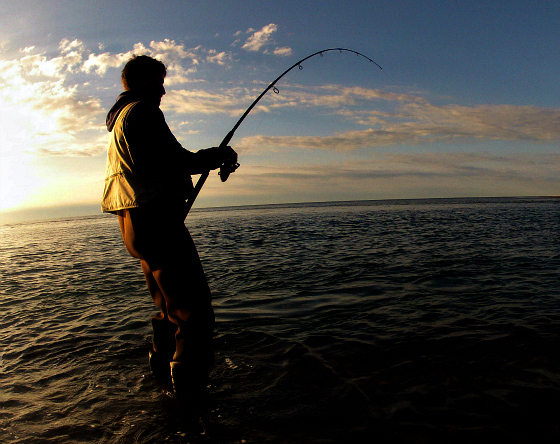 Or maybe low tide is better, because it allows an angler to walk out and access deeper water. It all depends on the particular beach. It’s easy to drive yourself a little bonkers if you try to approach all of this logically. There’s no checklist of conditions that guarantee fish will show in a certain spot. I think you’ll enjoy a greater level of success if you “take it all in” and then make a decision based on what feels most right to you. Over time you may subconsciously take notice of when certain conditions align, and you’ll instinctively know that a certain beach, at a particular time, during a specific tide, will produce a few fish. This is what I will be attempting to do this week when I fish long stretches of sand, rock, boulders and much more. There’s miles upon miles of shoreline to cast from, so I’ll be doing my best to take it all in and make a decision that not only feels right to me, but also aligns with how fish are behaving.